Cockatoos are are amazing birds with HUGE personalities... and a destructive streak. 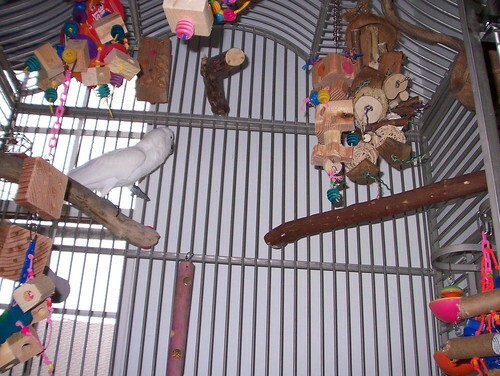 Moluccan and Umbrella Cockatoos (also known as M2s and U2s, respectively) are especially known for destroying furniture, going through toys like buzz saws, and shattering eardrums with their unbelievably loud screaming. They are also affectionate, playful and smart. Their intelligence leads them to get bored easily, and boredom is a frequent cause of feather destructive behavior (or in worse cases, self-mutilation). 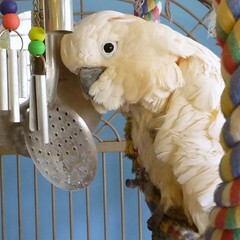 It is critical that cockatoos are provided with large cages that provide lots of room to move and a lot of enrichment opportunities. 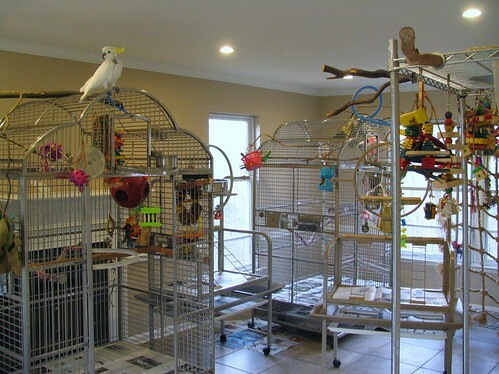 Below are examples of cages appropriate for cockatoos, along with ideas for cage setups and layouts. What kinds of toys do cockatoos like? Check out how some of these cockatoo owners try to ensure their 'toos are kept happy and entertained. Zoe is a 15-year old female Moluccan cockatoo. While she does get out 3-4 hours every day, she does spend a lot of time in her large double cage . Her owner Jenny keeps it stuffed with things to do, and she seems quite happy in there. 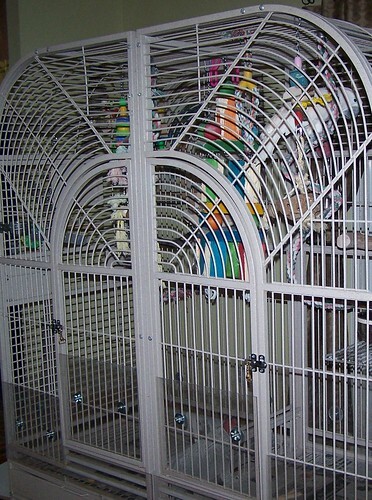 The cage is 64 inches wide by 32 inches deep - a great cockatoo-appropriate cage. To keep Zoe busy and mentally stimulated, Jenny rotates out multiple foraging toys, which Zoe figures out very easily. Enrichment ideas include buckets, cardboard boxes zip tied to the cage, hanging wooden toys, and anything with a reflective surface. 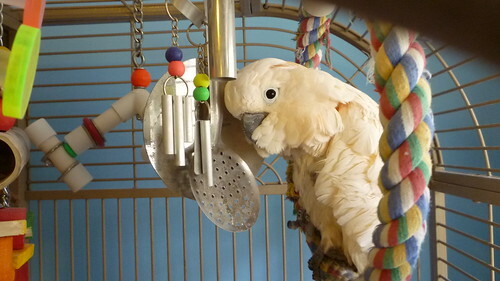 Zoe the moluccan 'too especially loves it when she can make ringing noises when she strikes her toys with her toes; so she enjoys sitting on her swing next to her chimes and ringing them for hours. Jenny provides a variety of toys and activities for Zoe throughout the cage, from the top all the way to the bottom to encourage lots of climbing and exploration. Jenny is the author of Project Parrot, a parrot behavior book available on the Phoenix Landing website and on Amazon. Buy Project Parrot: A Behavior Guidebook for You and Your Bird . 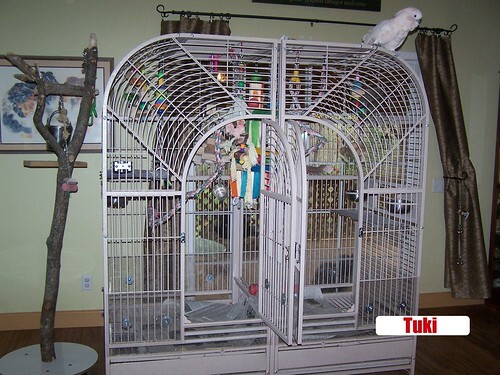 Tuki the M2 has a double cage similar to Zoe's above. 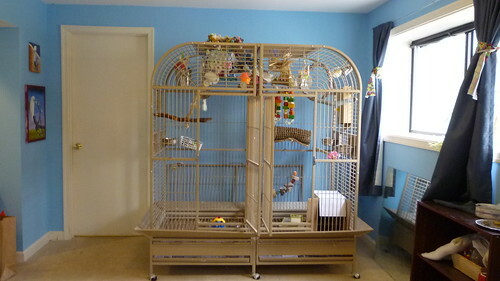 While the double cage is designed to accommodate a divider, in both cases the divider has been removed to give a single large bird additional space. Liz describes her cockatoo Tuki as a shredder who goes through toys very fast. Because Tuki goes through toys so fast, Liz buys a lot of dog toys -- like rope pulls, Kongs and dog balls; they are generally less expensive and harder for a strong cockatoo beak to destroy. In addition to wooden toys (and his dog toys and a cow bell he loves), he also has a variety of plastic toys and plastic chains. He loves to play with and chew up big wiffle balls. 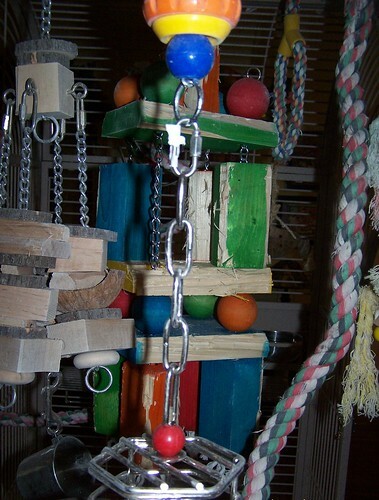 Liz also provides her Molluccan with big chunks of packing cardboard that have holes punched through; she then ties them to wood chunks and beads and attaches them to his hanging toys. "... or I just hand him a piece of cardboard to shred," explains Liz. 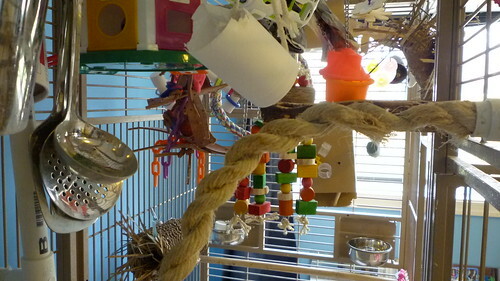 His cage also contains a stainless baffle box and a stainless steel bucket for treats and toys. 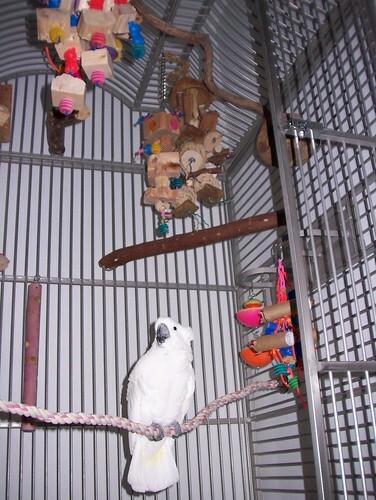 Inside his cage, Tuki has several natural wood perches, 2 rope perches stretched across (one on each side)., and a big wire walking shelf on one end between his water and pellet bowls. Note that there's still plenty of room for Tuki to stretch his wings. Adds Liz, "If you look closely you will be able to see the plexiglass panels we recently put around the bottom 12" or so of his cage. Protection against stray bites on curious dog noses." Liz's husband built the climbing tree that sitting out beside the cage that you can see in the first picture in Tuki's set. To create the homemade parrot stand, they took a roll around plant stand, added a melamine circle and mounted the "tree" using bolts. 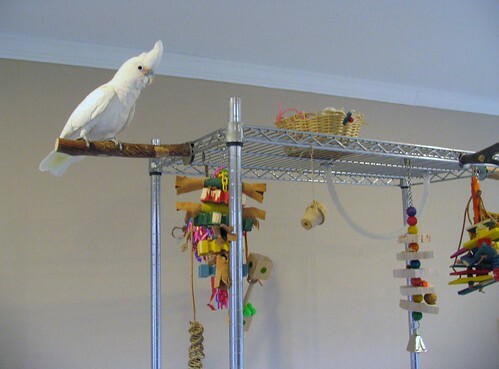 "We started out trying to make our own perches too, but Tuki tore them up too quickly so we bought the really nice hard ones. 🙂 "
Gemma has four cockatoos, three of whom share a special bird-proof room of their own. 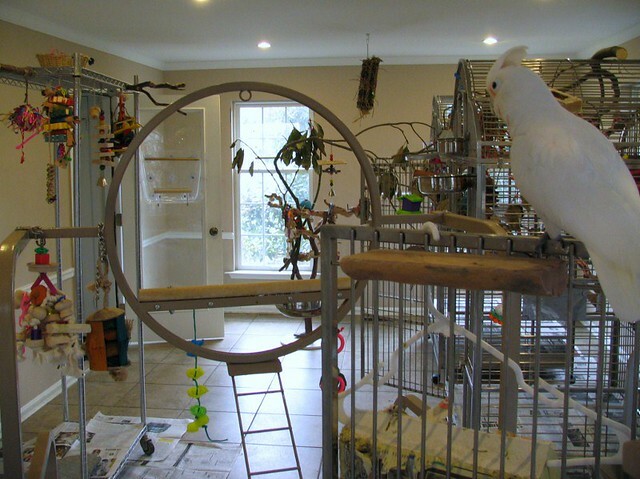 The cockatoos who live in the room are Tiny, a 9-year-old male Triton, Grace, a 10-year-old female Goffin's, and Mary Chapin, a 10-year-old male (yes, male!) Goffin's, who Gemma says chose not to participate in the photo session. 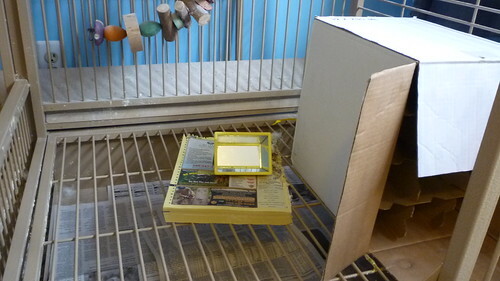 Gemma writes, "They all have access to the entire house but spend a large part of their time in the bird room. I provide them with as many choices as possible--in their perches, food stations, toys, and foraging opportunities. I make toys for them every day, mostly foraging toys made from other, used toys or cardboard boxes." 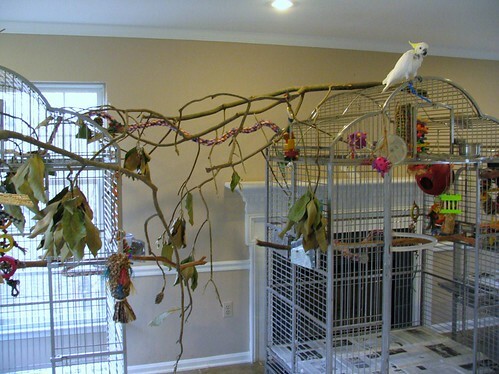 Take a look at the photos showing off these cockatoos' large stainless steel cages, parrot stands, natural branches from a magnolia tree, a grapevine floor tree, a variety of hanging toys for foraging, and a variety of perches. "A clothing rack from The Container Store makes a great roosting perch. It's one of the highest perches in the room and is away from the windows, which makes the birds more comfortable roosting there at night. I can also hang foraging toys from the rack. I placed a large flat stone on the bottom of the rack for stability. I hung a Get a Grip rope ladder on the other rack--the birds enjoy foraging and climbing on it," explains Gemma. Lara Joseph is avian behavior, training and enrichment specialist. Lara's cockatoos Rocky and Rico enjoy a variety of perches, natural branches, rope, different thicknesses throughout their cockatoo-appropriate dometop cages. She is conscious of making sure each bird has room to flap its wings if it wants. Rico and Rocky also enjoy the opportunity to look out the window, so they get perches specifically placed for that purposes. They have a toy within reach on each of these perches to give them something to do while they are looking out the window. Lara also reminds us that using cage placement is another option for providing "enrichment" opportunity as it allows birds to socialize even when in separate cages. 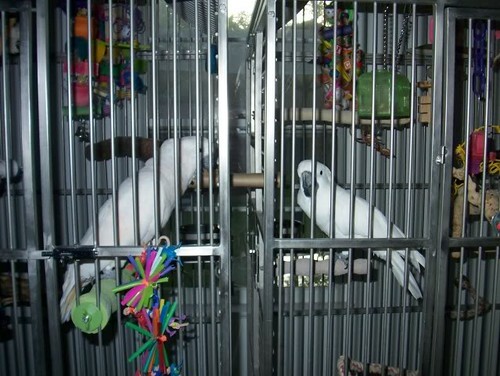 Here Rico and Rocky are interacting with each other, even sharing toys, with their cages pushed up close to each other. Lara's parrots also enjoy lots of out of cage play and training periods, and a large outdoor aviary. Learn more about Lara and her birds on her excellent bird enrichment blog. 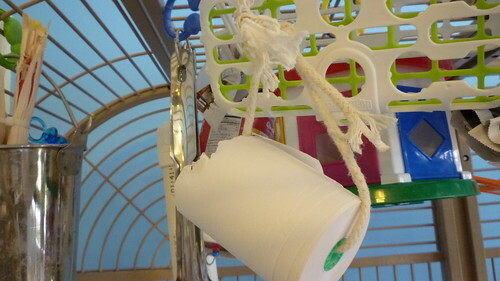 A common theme you'll see in all the examples of cockatoo cage setups above is the emphasis on lots space, lots of toys designed to be destroyed, as well as ample enrichment opportunities (such as foraging toys). Birds with such a high level of curiosity and destructive capabilities need to be kept occupied or their attention will turn to less desirable behaviors (like screaming, biting and self-mutilation). Of course, pet cockatoos need lots of appropriate human interaction also, but 'toos can easily become overbonded, so it's important to teach them how to play independently. 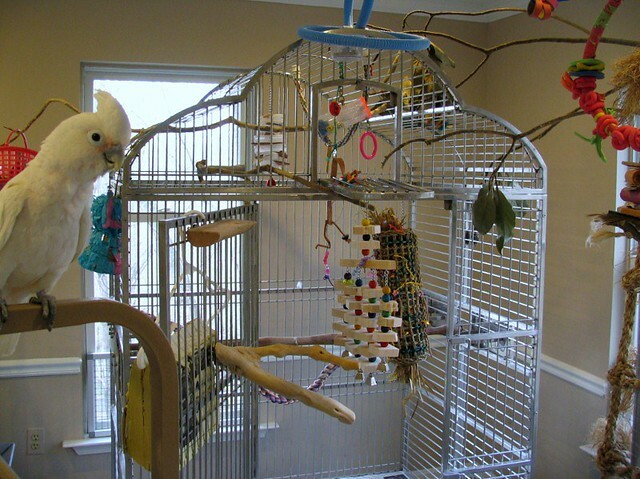 Your cockatoo's cage is like a parrot activity center, so make sure its big enough to house all the toys they love and need without overcrowding them. 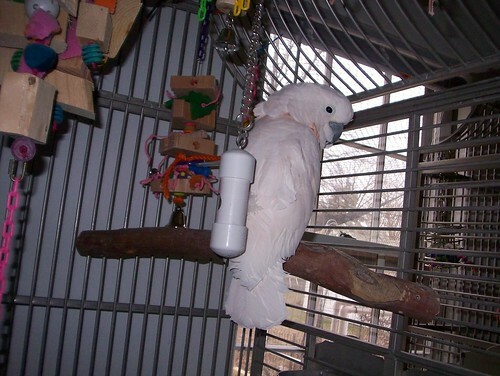 Hopefully, the photos and descriptions above will help you pick out and decorate your cockatoo's cage and provide you and your bird lots of enjoyment. Looking for More Cage Examples? For more information about parrot cages and setup ideas, check out the links above as well as our basic guide to cage sizes and bar spacing. Image credits: All photos used with permission. Big thanks to the contributors -- Jenny Drummey, for pictures of Zoe; Liz for pictures of Tuki; Gemma for photos of her amazing bird room; and Lara Joseph for photos of her cockatoos Rico and Rocky. Thank you for all your advise – we will soon have a new member to our family, so we are building her a new home in our livingroom. With all the photos and information this will be helpful in making sure it will be a great experience for her. Next post: Personality DOES Matter!